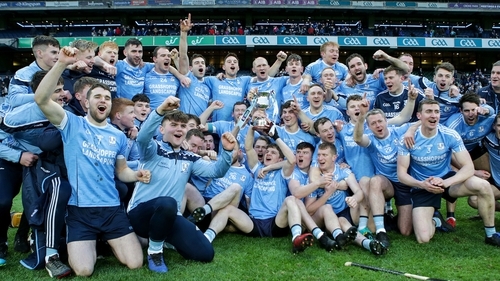 Oranmore-Maree staged a tremendous 12-point turnaround to claim the All-Ireland Intermediate Club title over Charleville in Croke Park. Having been six points down at the break, Niall Burke was simply breathtaking, single-handedly dragging the Galway side over the line with a haul of 1-11. Charleville will rue their indiscipline in the second half, ending the match with 13 men when Jack Doyle and Cathal Carroll were dismissed. The physicality was apparent in the opening exchanges as both sides brought ground-shuddering thuds of intensity to the showpiece. Pádraic Keane used all his skills to eke out some space for himself and fire over the opener for Oranmore-Maree. Cork star Darragh Fitzgibbon ended the day with ten, landed all of Charleville’s four opening points only to be pegged back by Galway’s very own sharpshooter, Burke. The game threatened to become a shootout between the two marksmen but the intricate attacking play of the Cork side turned it in their favour. Having been level times Daniel O’Flynn and Jack Doyle opened a three-point lead for the Ben O’Connor-coached side. Andrew Cagney encapsulated the sharpness of the attacking power on offer with a calmly taken goal. Receiving a hand-pass on edge of the square the corner forward still had a lot to do, but he rounded his marker and accurately dispatched to the net. Oranmore-Maree were struggling to get a foothold and Alan Burke’s second point was crucial, making it a two-score game, 1-10 to 0-07 at the break. The second half began in similar fashion to the first, with Burke and Fitzgibbon trading a couple of scores each. Seán McInerney broke the sequence with a battling point under pressure. Gearóid McInerney boomed an inspirational score to tilt the game in favour of the team managed by his father Gerry. Cagney did pull one back but substitute Éanna Burke and Seán McInerney landed his second with the use of Hawk-Eye before the second red card for Cathal Carroll. When the Charleville’s heads were spinning and running out of legs, Oranmore-Maree sensed the kill and patiently did so with two goals. Niall Burke first rifled a penalty and Sean McInerney rounded off a superb half with blistering goal. Burke deservedly had the final say with a sublime point on the run right on the the sideline under the Hogan where he would later collect his man-of-the-match award. Oranmore-Maree: Rory McInerney; Sean Bannon, Shane Geoghegan, Alan Bannon; Mark Hanniffy, Gearóid McInerney (0-01), Liam Keane; Niall Geoghegan, Rian Maher; Marcus Quinn, Alan Burke(0-02), Niall Burke (1-11, 0-04f, 1-00 pen, 0-03 65); Ross Malone , Pádraic Keane (0-01), Seán McInerney (1-02). Charleville: Cian Collins; Darren Butler, Jack Meade, Finbar Cagney; Alan Dennehy, Jack Buckley, Cathal Carroll; Jack O’Callaghan, Kevin O’Connor (0-01); Daniel O’Flynn (0-01), Darren Casey, Jack Doyle (0-01); Andrew Cagney (1-01), Darragh Fitzgibbon (0-10, 0-06f0-0165), Conor Buckley (0-01). Subs: Tim Hawe for K O’Connor (55).